More than 50 years have passed since Browns Blue ceased its network of services in West Leicestershire. Friday 15th March 1963 was the final day of service, before the company was sold to Midland Red. In 1924, Lawrence Daniel Brown of Markfield started what was to become the most successful private bus and coach business in Leicestershire. As was common at the time, the first vehicle was used as a lorry and as a bus. It was kept at his house, now 35 Ashby Road, where the roof of the garage can still be seen. Lawrence would take workers from Markfield and Stanton to the Anstey shoe factories. He would then convert the vehicle to a lorry for delivering coal, before re-attaching the ‘Dixie’ type bus body for the return works journey. This first vehicle was a Chevrolet and came to be named the ‘Nancy’ after his younger sister Annie (known as Nancy). Lawrence experimented with different colour schemes, finally adopting a deep blue and red livery, although the detail of the combination varied from time to time. The name ‘Brown’s Blue’ quickly became well known. He was extremely keen to expand the business, acquiring new and larger vehicles, separating buses from lorries, purchasing the businesses of other operators and opening a new garage in Markfield. The competition with similar minded operators was intense. By the early 1930’s, services ran to Loughborough, Whitwick, Coalville, Stanton, Groby, Leicester, Anstey and Desford Colliery. Excursions and tours were offered. At the outbreak of WWII in 1939, there were ten vehicles. ‘Flagship’ vehicles were requisitioned by the War Department for allocation to the forces, very few of which were returned. The War Department became responsible for the allocation of all new and second hand vehicles. New bodywork was designed to wartime ‘utility’ specifications. Most private hire and excursions ceased, women were taken on as conductors and drivers, fuel rationing and labour shortages led to a tightening of timetables and contracts were obtained for troop movements. Vehicle maintenance became increasingly difficult. The lorry fleet was kept busy in the early war years, and assisted with the massive clear up in Coventry after the disastrous bombing on 14th November 1940. However, in 1942, the haulage part of the business came to an end as the lorries were sold to the Cliffe Hill Granite Company. Lawrence concentrated on the buses, expanding the fleet. In June 1946, the fleet was doubled overnight and a new base secured in Ibstock, with the takeover of the Green Bus Service. New destinations included Ashby and Hinckley, local colliery services, excursions and tours. The first double deck bus entered the fleet in August. A taxi service also came to be operated. The business of Warner & Sons of Markfield was acquired in 1948, bringing another 10 vehicles. By the end of the decade, there were around 41 vehicles. Less essential services, excursions and tours had started to reappear, with a fully revised timetable taking effect in 1950 as fuel rationing ended. Expansion continued during the 1950’s, with the purchase of other operators and more and different buses. In 1954, the various businesses consolidated into a limited company, Browns Blue Coaches Ltd (without the apostrophe in Browns!). An emergency timetable operated in 1956/57 due to fuel shortages during the Suez Crisis. 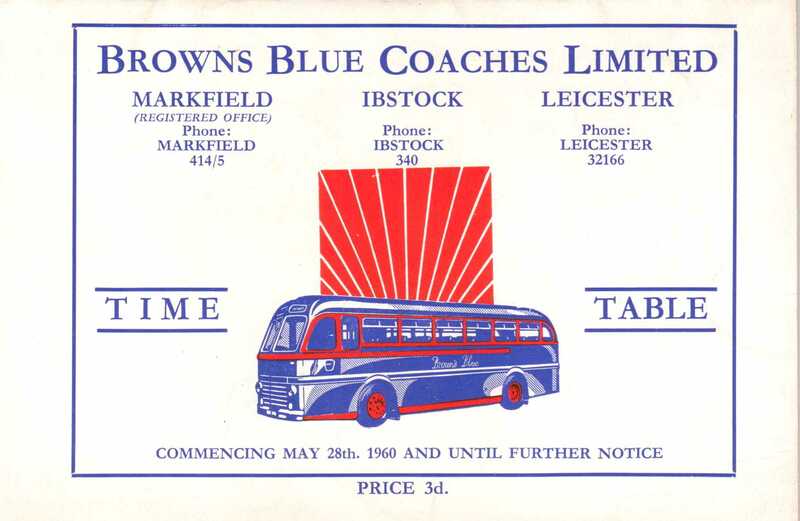 Browns Blue was a founder member of the Midlands Area Coach and Transport Association, formed by several medium sized operators in response to the continued expansion of the Midland Red. Lawrence Brown died unexpectedly in 1957, a week after being suddenly taken ill. The two eldest sons assumed the day to day running of the company, continuing to expand by taking over other operators and acquiring replacement buses, including nine sold by London Transport. Lighter shades of blue were used from 1959. By the late 1950’s, Midland Red was the major operator in Leicestershire, having steadily expanded its route network by buying smaller operators. Car ownership was on the increase and further consolidation was needed if services and operators were to survive. However, the company continued to buy, sell and scrap buses. 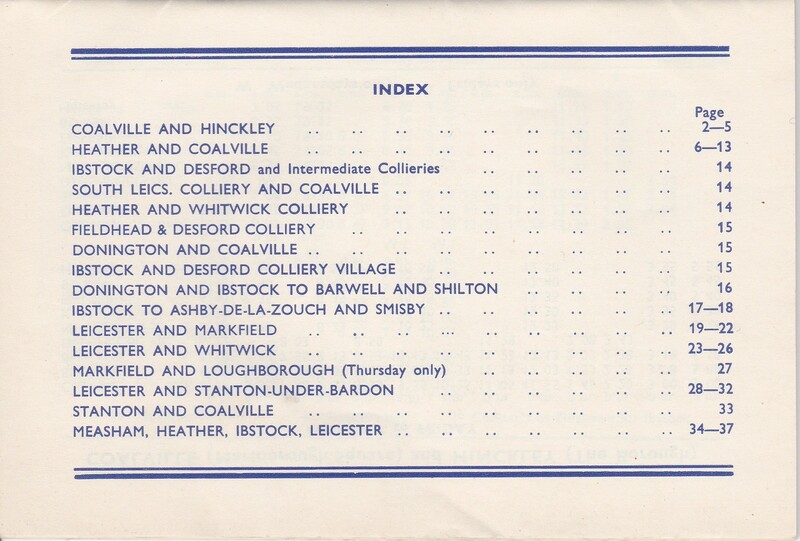 The May 1960 timetable (pictured), listed some 16 routes, covering places such as Coalville, Hinckley, Heather, South Leicestershire Colliery, Ashby, Ibstock, Markfield, Leicester and Loughborough. On 9th November 1962, the Coalville Times announced that Browns Blue was to be taken over by Midland Red. Negotiations between Browns Blue, Midland Red and the Traffic Commissioners continued into 1963. The last day of operation was 15th March 1963. Midland Red took over the public service routes and the operations at the Markfield (Shaw Lane) depot. The Midland Red 'Notice to Passengers' can be seen on the adjacent page. Three staff formed a new company, Reliant Coaches, to work some of the Browns Blue contracts and private hires, buying some coaches and the Ibstock depot. Gibsons of Barlestone purchased a double decker and the entire stock of ticket machines. All the other double deckers were driven to a parking area next to the Copt Oak public house and made ready for disposal. Staplefords of Markfield purchased a coach. After the company was sold, Norman and Terry Brown formed “Browns Blue Garages Ltd”, a petrol station just past the Flying Horse roundabout, opposite the Shaw Lane bus garage. The several subsequent owners have retained the name to the present day.